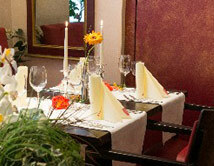 The traditional building right at the market place of Burg is family managed since 1750 and welcomes hotel guests since 1822. 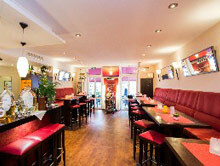 Our hotel is situated in the center of the island capital Burg. You will find all kinds of shops nearby. In the morning we offer a breakfast buffet. We serve delicious fish specialties and seasonal varieties in our restaurant or at the outside terrace. Our traditional house, directly on the market, has since 1750 owned by the family and has a wide range of rooms and apartments in different styles and categories. So you can decide according to your needs. 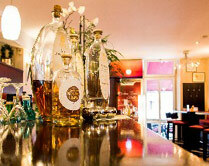 Let yourself be spoiled in our restaurant in friendly atmosphere. A cozy room with fireplace, and a large outdoor terrace overlooking the city, also belong to our restaurant area. Our seasonal menu, we offer among other things a selection of regional fish and meat dishes. Our guests can expect a varied breakfast buffet in the morning. Look forward to the day on the sunny island of Fehmarn, whether sunshine or Baltic Storm - use the beauty of our island and try sometimes something new. Breakfast buffet: from 07:00 - 10:00 am.